Core your apple, halve it, and slice it into thin slices. Grate your cheese so it melts faster in the sandwich. Melt 1 tablespoon of butter in a large skillet over medium-low heat. Then add a slice of bread and let it soak up some of the butter. 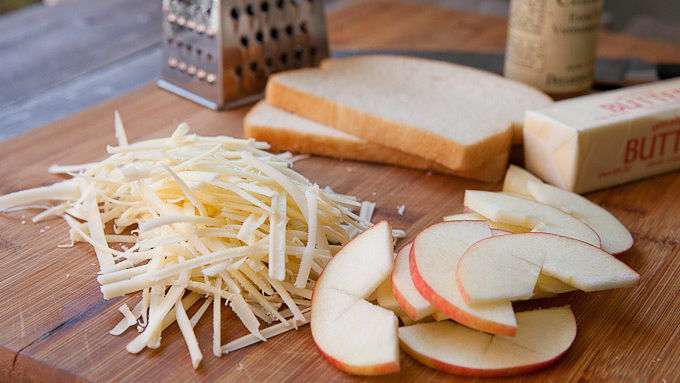 Add half of the cheese to the bread, followed by a row of apple slices. 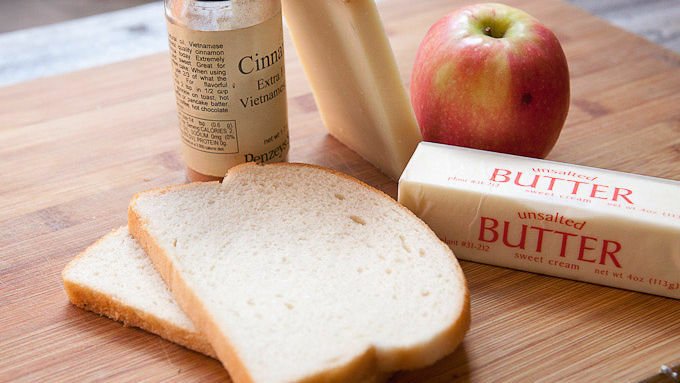 Sprinkle the apples generously with cinnamon and top with a second piece of bread. Let the sandwich cook on that side for 2-3 minutes and then carefully flip the sandwich. Rotate the sandwich a bit so the melted butter in the skillet soaks into the second bread slice. Let the sandwich cook for another 2-3 minutes on the second side. 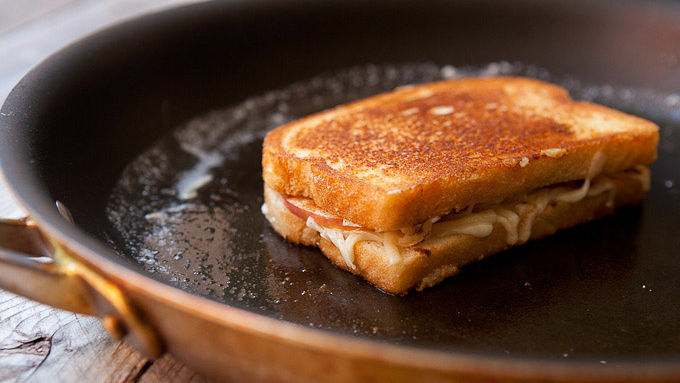 If your cheese isn't melting and your sandwich is burning, you can quickly melt the cheese by adding a drizzle of water to the pan and covering it with a lid or bowl to steam the sandwich for a few seconds. 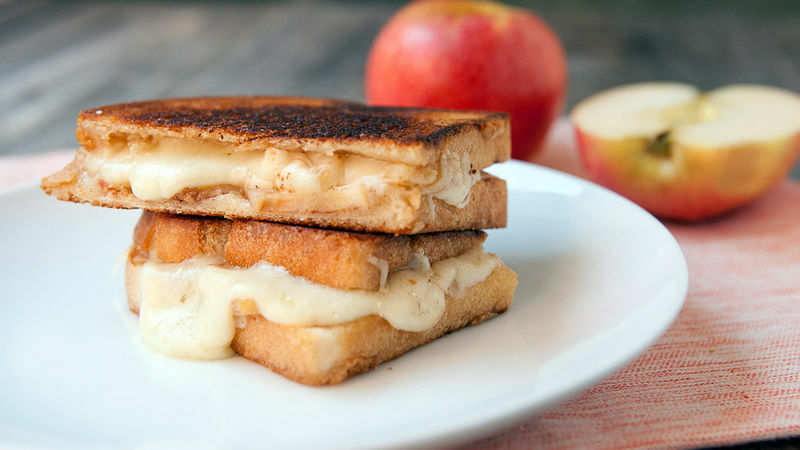 You might have had a grilled cheese before, but you've probably never had one like this! There are lots of reasons why I think fall is the best season. The weather is temperate and the colors are beautiful. But I mostly love fall because of the plentiful vegetables and fruits. This sandwich just makes sense for the start of fall. 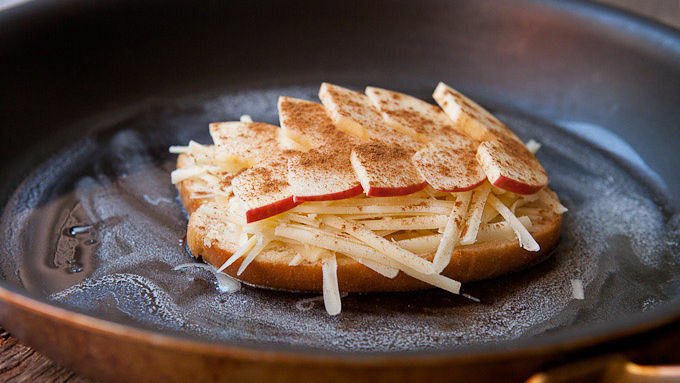 Not only should you be able to find nice apples everywhere right now, the gooey Gruyere and cinnamon in the sandwich just round out the fall flavors. There’s nothing hard about this grilled cheese, and the ingredients are simple enough – which makes it even better. The only thing I’ll say is that while Gruyere is an expensive cheese, it completely makes the sandwich, so do try to hunt it down. In a pinch, you could substitute Swiss cheese though. This sandwich cooks fast, so make sure to prep all your ingredients before you start cooking. Enjoy fall and enjoy this sandwich!